Proven technology, creative solutions, flexible production! 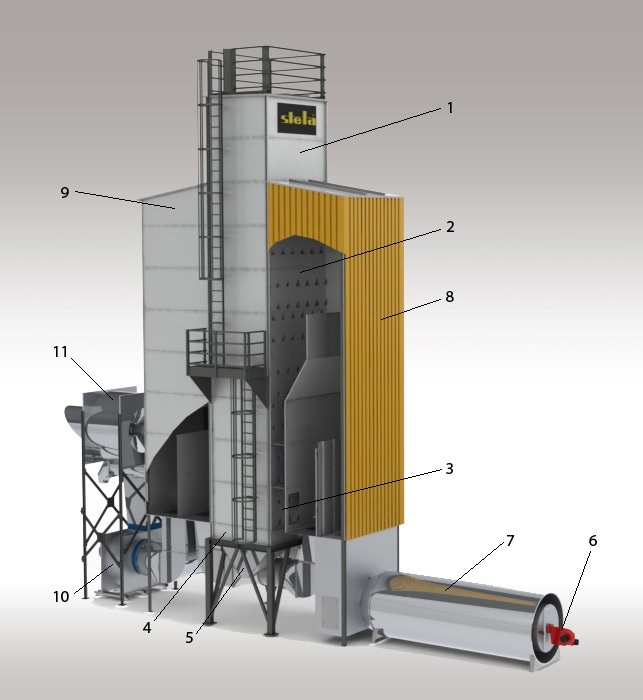 Small or quite high capacities; with or without dust separation, continuous-mixed-flow or circulating batch dryers; gas, oil, steam or special heating - STELA is the right partner for everything! We develop the suitable solution also for extraordinary space conditions! 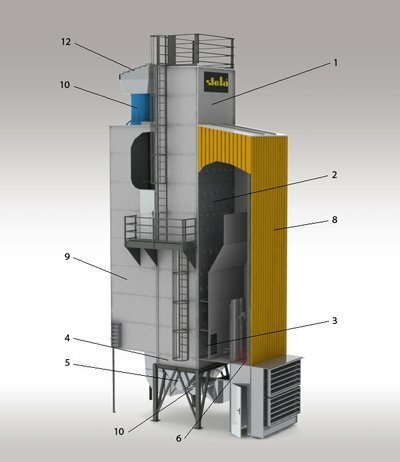 There are more than 2000 stationary STELA dryers all over the world. The experience was integrated into our current new developments like the complete automation of the drying process with EQtronic, providing enormous energy and cost savings, or the advanced technology of energy recovery. For the design of your drying plant, there are numerous variants, which are assembled individually. According to your wishes, you will receive an optimal design for your application with the suitable components. The following examples will show you some possibilities which can be realized. The free flowing product is fed into the store tank (1), runs due to gravity through the drying (2) and cooling elements (3) until it is discharged in batches by the discharge device (4) into the discharge hopper (5). Burner (6) and air heater (7) - direct or indirect heating are optionally possible - heat up fresh air. The exhaust air of the cooling elements is mixed with this air. Thus the whole heat stored in the product is led back to the drying process (energy saving by heat recovery). The large-scale hot (8) and exhaust air caps (9) guarantee an optimum air and heat distribution in the dryer column. The hot air flows through the product pile, absorbes moisture and is sucked off from the exhaust air cap by the exhaust fan(10). The dust-laden exhaust air is cleaned in the centro separator (11) and carried off into the open air. The separated dust gets through pipes to the dust bin or to a bagging device. Not only the exhaust air from the cooling zone, but also the exhaust air (and so the contained energy) from the lower dryer elements is recovered by means of a circulating air fan (10). A pneumatic discharge slide (4) brings about short discharge cycles. By means of pneumatic air flaps, which are installed blow-out-sided at the fans (10), the air flow is interrupted during this short discharge cycle. The share of the total air volume that can be recovered as so-called circulating air depends on the initial moisture of the product which is expected on an average and on the parameters of the ambient air. So the plants are calculated and designed depending on the site - e. g. Central Europe, Southern Europe or the Tropics. A dryer in Central Germany, which is designed mainly for maize drying with an average initial moisture of 35 %, requires another air distribution than e. g. a dryer in Southern Hungary, where average initial moistures of 22 % are expected.